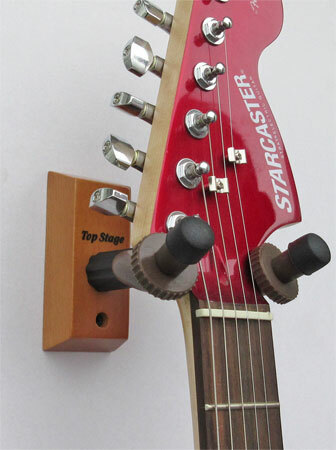 Item shown above : Guitar Hanger in Natural wood color in display (Guitar not included). Professionally finished guitar hanger that will proudly display your guitars, banjos, basses, mandolins, and other stringed instruments while keeping them safe & out of the way from harm, works on all guitars! The steel hook is rated to support up to 60 pounds, Wooden piece adds an elegant appearance. Specially coated for prevent damage to the guitar: will not mark the finish of your instrument! Comes with Screws and dry-wall plastic anchor.